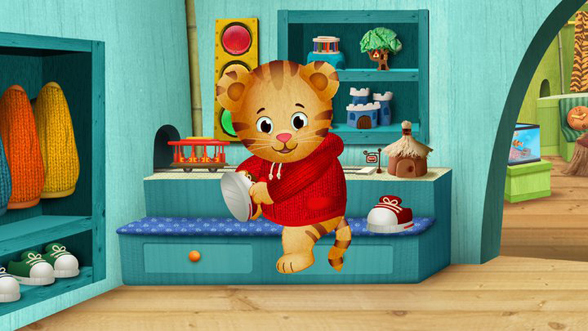 This morning, at the Television Critics Association’s Summer Press Tour, PBS announced the launch of production for DANIEL TIGER’S NEIGHBORHOOD, a new animated multi-platform series inspired by one of the most beloved PBS classic television series, MISTER ROGERS’ NEIGHBORHOOD. The new preschool series is an animated version of the original Neighborhood of Make Believe in which a four-year-old Daniel Tiger is the star of the show who talks directly to the home audience inviting them in to his world. The first television series produced by The Fred Rogers Company since MISTER ROGERS’ NEIGHBORHOOD, DANIEL TIGER’S NEIGHBORHOOD will launch in Fall 2012 on-air on PBS KIDS, along with a robust website, including free, interactive games for kids, online resources for parents and teachers, and other cross-platform content. There's some more details on this Pittsburgh Post-Gazette blog. Right now I have mixed feelings about this. On the one hand, I love Mister Rogers, and since it is his company producing this show, I would hope it is really great. On the other hand, Mister Rogers Neighborhood is as close to perfect children's television as you can get, and I would really rather just see PBS showing more of it. My kid will probably be too old for this show by the time it finally rolls around, but in the meantime we'll keep watching Mr Rogers episodes whenever we can.